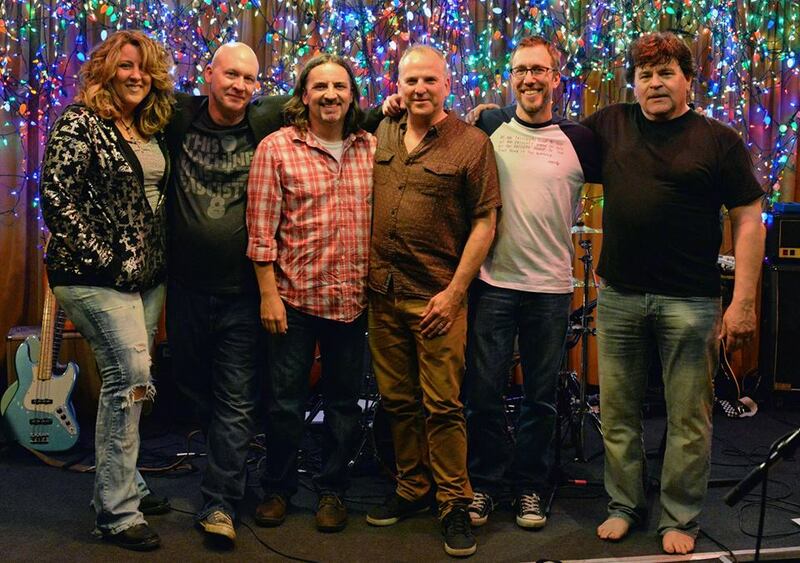 Since their formation in december of 1996, shoot lucy has been bringing audiences a sense of anecdotal American roots rock, and “y’all-ternative” with an occasional pop-rock twist. Hailing from Minneapolis, shoot lucy’s sound has been described as acid country and folkternative, but however you decribe them, their unpretentious and almost self-deprecating lyrics convey a light-heartedness to this band that makes for a well rounded show that’s usually full of surprises. In addition to their finely-crafted originals, the band has a vast catalog of cover tunes both familiar and obscure that are sure to keep audiences of all ages interested. Unlike many bands today, shoot lucy is equally at home playing an electric set in a rock club, or a more laid-back acoustic show in a more intimate setting. The band’s debut release Bipolar Expedition, produced by Tom Herbers (Honeydogs, Jayhawks) is representative not only of the band’s signature sound and musicianship, but also their unique sense of humor and worldview. As a result shoot lucy has performed live on KQRS radio in minneapolis and KVSC radio in St. Cloud, received airplay on KTCZ (Cities 97) and KFAI in the Twin Cities, as well as on radio playlists as far away as Belgium, Italy and Sweden. shoot lucy has played hundreds of shows, and has performed at nearly every major club in the Twin Cities area, including headlining The Cabooze, O’Garas,and the 400 bar and playing shows at The Fine Line, Mayslacks, Lee’s Liquor Lounge, Seventh Street Entry, Terminal Bar, and Bunkers. In addition we’ve performed in such wide ranging venues as the legendary Surf Ballroom in Clear Lake, IA, The Venue and JT Cigarros in Fargo, ND, and the University of Wisconsin Stout in Menomonie, WI. shoot lucy performed before two St. Paul Saints baseball games and also performed on the main stage at the Bash in the Grass festival in Brookings,SD, a major festival featuring the national acts Soul Asylum, Slobberbone, Spacehog, Blues Traveler, Nitty Gritty Dirt Band andThe Kentucky Headhunters. shoot lucy’s music has also been featured in two independent films, Bohimbled and IceBreaker. Now celebrating their 20th year as a band, they’ve released a stellar followup to their debut. The Soothing Sounds of Shoot Lucy proves that good things come to those who wait. Recorded at Drum Farm Studio in Menomonie, WI, the band is in top form, with the addition of backing vocalist Jennifer Urbach adding a layer of harmony that makes the band sound that much more full. The songs run the gamut from straight-ahead rock, to sad country/Americana to lighthearted pop, exactly what you’d expect from these guys (and girl). Rock ‘n’ Roll can still be fresh and fun. Soothing Sounds of @shootlucymusic jumped out of a stack of review CDs. The cover of the latest record by Minneapolis alt-country sextet Shoot Lucy, wittily entitled The Soothing Sounds of Shoot Lucy, has on it an old radio sitting on top of a dresser. It made me think of Wilco’s twangy, early masterpiece A.M. Like that Wilco record The Soothing Sounds of Shoot Lucy is chock full of delicious hooks and melodies, and dappled with lyrics and themes which are at times, depending on how you view them both serious and funny at the same time. The record opens with the song “Disproportionally Hot Girlfriend.” Musically it’s a simple and catchy country tune complete with bluesy guitar licks and a verse chorus verse vibe. The kicker here is the title and the story behind it, which is about a hot girl who is dating an ugly guy. Next on the equally twangy “I’m Blind” singer Dave Berntson tones down the hokey-ness a bit but still manages to glimpse a dark side of humor lamenting during this breakup song “Can’t even go to my bar / because we met there.” They say jokes are all about timing and delivery and this one, sad and funny at the same time, hits the bulls-eye. ​Contrast this with the more sing-songy honky tonk of a song like “Devil on Your Shoulder” and you begin to see that Shoot Lucy are a band of elegant tricksters, able to manipulate situations with a musical sleight of hand. One gets lost in the soothing sounds of Jennifer Urbach’s backing vocals, falls under the spell of Chris Berg’s heart thumping bass lines and David Nahan’s crystalline solos, and is willingly trampled by the beats of dual drummers Scott Skaja and Steve Schultz. The fact that they are all such accomplished musicians and excellent songwriters helps to make their jokier songs that much better, like the offbeat “Lost” which has all the upbeat happiness of song that would be on a record for kids. And then there is the “Never Thought About You” which is genius in the fact that Bernston has been crying wolf on so many of these songs, yet his lyrics here could either be from a man who is trying to convince himself that the dissolution of a former relationship isn’t bothering him. Shoot Lucy return to the children’s sing-song on “Won’t Go That Far” before closing the record out nicely with the slow burn bluesy alt country rocker “What About Me,” a worthy bookend to The Soothing Sounds of Shoot Lucy. There are very few funny, good bands that I can recall and none of them, Ween or Pavement, sound anything like Shoot Lucy. The music and the humor are different. I do think however of earlier comedy acts like the Smothers Brothers and Steve Martin banjo standup. It’s difficult to pull off a record of serious music with a humorous themes but The Soothing Sounds of Shoot Lucy does just that, and it is a thing of odd beauty. Second outing from this Minnesota based power poppy/roots inclined six piece. Formed in 1996 this is their second album release. It is a lot of fun. The band is led by Dave Bernston who is their song writer and lead singer. He can write songs with the humorous consideration of another’s partner on the opening Disproportionately Hot Girlfriend, to the more serious consideration of how a domestic fallout can have an effect, often unintentional, on those around the bickering and belligerence in Not Their War. I’m Blind features some nice pedal steel from guest Adam Ollendorff. Elsewhere guitarist David Nahan plays some lap steel to add that roots feel. They appear to have two drummers which gives a strong rhythmic foundation. They are Scott Skaja and Steve Schultz. The line-up is completed by Chris Berg on bass and Jennifer Urbach on Hammond organ and backing vocals. All bring these songs to life. There is a little of the Rembrandts about them but with a perhaps broader sound base. The album features 8 songs and all are underpinned by a strong melodic sensibility and Bernston’s vibrant vocal. Lost considers the advice of other, most likely, unwanted with lines like “you should really go to church” and “you should really quit that horrible band.” While Won’t Go That Far is the response of a potential girlfriend to his abilities in terms of his mode of transport or guitar playing ability leading her to put limits on their intimacy potential. The soothing sounds on offer here may not send you to sleep but they will have you tapping your feet, (occasionally) singing along and enjoying this collection of songs that sound like they came from another time and place and the more welcome for it. Right from the get-go these minneapolis-based boys will put a smile on your face. There’s nothing fancy or pretentious here, just good ol American rock n roll poised with tongue firmly planted in cheek. Their midwestern charm matched with straight-ahead song structures recall the best works by early R.E.M, The Gin Blossoms and the Jayhawks. If you’re looking for strong independent rock with a jangly country edge and a sense of humor, Shoot Lucy is sure to satisfy. In any case, call it what you will–country, newgrass, y’all-ternative–this cd rocks. Ears will be rewarded with a memorable album laced with understated songs of the ups and downs of life. Like the band itself, understatement is one of this cd’s greatest and most enduring strengths. For the most part, the band gallops at a punky pace with supremely catchy melodies and an infectious spirit that draws you into the album. You’ will enjoy this album’s passion and overall joyfulness. While this is music for a Saturday night, I am fairly sure you wont able to limit this great cd to just one day of the week. Pick it up! !